President Pervez Musharraf of Pakistan says he would be willing to commit troops to Iraq if they were part of a United Nations-backed force including other Muslim nations. Speaking after talks with United States President George W Bush on the sidelines of the UN General Assembly in New York, General Musharraf said it was vital that any such force was not viewed as part of the US-led occupation. Earlier General Musharraf told the UN that Iraq could not be allowed to remain "an open wound" as this would "impact on the region and could inject a new dimension to the campaign against terrorism and extremism". In his speech General Musharraf also accused India of refusing dialogue in what he called the world's most dangerous dispute, over Kashmir. The Bush administration has been trying to win support from Muslim countries for its presence in Iraq - however, there was strong opposition from the Muslim world for the initial invasion and this resistance has largely remained. Correspondents say the inclusion of Pakistani soldiers in an Iraq peacekeeping force would give it much greater legitimacy in Arab and Muslim nations. "At the end of the day, we would like to send Pakistan forces not to be seen as an extension of occupation but to be seen as a force which has gone there for the welfare of the people of Iraq," General Musharraf said. 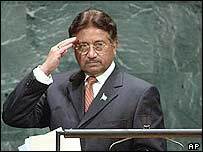 General Musharraf told the UN it was now necessary to bridge the gulf of misunderstanding between the West and Islam. He urged the West not to demonise Muslims. "The West perceives the Islamic world as volatile and hostile, bent upon striking at Western values," he said. "Islam must not be confused with the narrow vision of a handful of extremists." General Musharraf added that Pakistan was doing all it could to support the war against terrorism. "We are acting against al-Qaeda and its associates effectively," he told the UN assembly. "Our actions speak louder than words." Speaking of other matters close to home, General Musharraf said neighbouring India was pursuing a sustained military build-up that threatened to destabilise the balance of power in South Asia. He repeated his call to India to join Pakistan in a sustained dialogue to solve the Kashmir crisis, and urged a complete ceasefire along the Line of Control which divides the disputed territory. Indian Prime Minister Atal Behari Vajpayee is also in New York and met Mr Bush separately. Correspondents said Mr Bush's talks with both men were likely to have focused on terrorism and security, as well the situation in Iraq and Afghanistan.